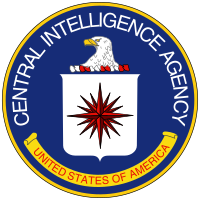 Is é an Central Intelligence Agency (CIA) (Gaeilge: Lárghníomhaireacht Fhaisnéise) an eagraíocht fhaisnéise is tábhachtaí i Stáit Aontaithe Mheiriceá. Bunaíodh an ghníomhaireacht seo i 1947 chun eolas faoi rialtais, daoine agus eagraíochtaí eachtracha a fháil agus a scrúdú. Is eolas luachmhar é seo do rialtas na SAM. Tá ceanncheathrú an CIA suite i Langley, Virginia, in aice le Washington, D.C. Tá an CIA cosúil leis an MI6 sa Bhreatain agus an Mossad in Iosrael. Tugadh an leathanach seo cothrom le dáta an 4 Aibreán 2017 ag 03:04.